Retired naturalist and wolf expert, Russell Core (Jeffrey Wright), journeys to the edge of civilization in northern Alaska at the pleading of Medora Slone (Riley Keough), a young mother whose son was killed by a pack of wolves. As Core attempts to help Medora track down the wolves who took her son, a strange and dangerous relationship develops between the two lonely souls. However, when Medora's husband Vernon (Alexander Skarsgard) returns home from the Iraq War, the news of his child's death ignites a violent chain of events. As local cop, Donald Marium (James Badge Dale), races to stop Vernon’s vengeful rampage, Core is forced on a perilous odyssey into the heart of darkness. Before you watch Netflix Original Film, Hold The Dark, ask yourself one question. Is a mystery more powerful and ultimately more satisfying before its secrets are revealed or are answers always necessary? Your enjoyment of Jeremy Saulnier’s film will very much depend on your response. For, Hold The Dark is an ambiguous and enigmatic puzzle, a mysterious thriller that steadfastly refuses to share its secrets. A challenging and brutal film that leaves its audience with more questions than answers. This will likely irritate and potentially alienate some viewers. I can certainly understand why Hold The Dark is proving divisive. While there are clues, a first watch of this film is pretty bewildering. In addition, unlike his previous two films - the superb Blue Ruin and Green Room - Saulnier’s storytelling (from a script by the director’s close collaborator, Macon Blair) is often frustratingly vague - leading me to question if this film is more than the sum of its, albeit impressive, parts. However, despite its many impenetrable mysteries, I loved Hold The Dark. Saulnier's film gripped me from the start and I haven’t been able to shake its unsettling and brooding atmosphere since. The cast all give powerful and convincing performances. Riley Keough impresses once again - as does Alexander Skarsgård. Meanwhile, Jeffrey Wright is superb in his role. The film's cinematography (by Magnus Nordenhof Jønck) is stunning. The Alaskan landscapes are utterly breathtaking. Layer up as this movie will chill you to the bone (literally… I had to grab a blanket as I watched). More than anything, I loved how Saulnier made me work to understand his story (and I am not sure I do… yet). This is a gripping film to experience and then puzzle over. After all, who wants a neat and obvious ending? Surrender yourself and you will find a brilliantly bleak and haunting tale. Saulnier is a master of suspense. Nothing in Hold The Dark is what it seems and you sense that anything could happen. Few directors working today can make an audience feel so deeply uncomfortable… so very unsafe. Few directors then have the nerve to deliver on this threat with such unflinching brutality. Many scenes in Hold The Dark make for a tough (and gruesome) watch. However, there is nothing gratuitous here. Each moment of shocking violence forces us to question why humans behave in the way that they do and asks us to consider the impact of that behaviour. As a result, on almost every level, Hold The Dark is not the revenge thriller that you may be expecting and, for that, I am so thankful for filmmakers like Jeremy Saulnier. Whether you enjoyed Hold The Dark or not, I would very much recommend Jeremy Saulnier’s Blue Ruin (I think this one is my favourite) and Green Room. 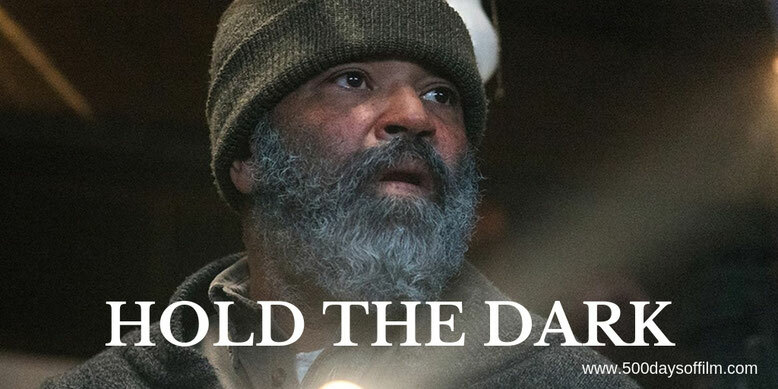 Have you seen Hold The Dark? If you have, what did you think of this film? Let me know in the comments section below or via Twitter. You can find me @500DaysOfFilm.